This week I got cabbage in my veg box, I really like cabbage, but it's not very inspiring. So I couldn't really decide what to do with it. I asked a few people at work and the results were to put it in mashed potato or stir fry it with chili and garlic. 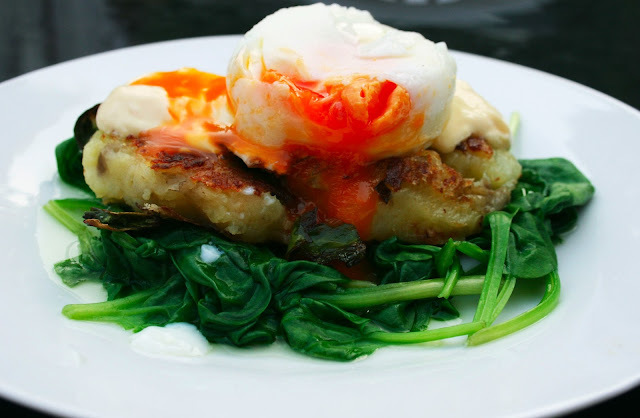 I really wanted both of these things, so I decided to combine them together and make bubble and squeak cakes with chilli and garlic. My brother was hanging around the kitchen while I was making them, telling me how disgusting they sounded, (this is the usual reaction to whatever I'm cooking) but then decided that he actually wanted some too after smelling them cooking. So we both had them on a bed of wilted spinach, topped with hollandaise sauce and a poached egg. This is my new favourite dinner. I've had it twice this week and already want to make it again! Wash your new potatoes, them pop them in to a pan with boiling water and leave to boil for 20 minutes. Melt the butter in a separate pan, then add the cabbage, chili and garlic and stir fry on a medium heat for around 10 minutes. When the potatoes are lovely and soft, drain off all of the water and mash up the potatoes, add the cooked cabbage mixture and mix up well. Leave the mixture to cool, until its cool enough to handle then mold them in to 4 burger shapes and pop on to a floured plate. You can now either pop them in to the oven on a low heat while you prepare your toppings, or stick them straight in to a frying pan with hot oil and fry until golden brown on each side. Serve with spinach, poached egg and hollandaise sauce, or whatever else you fancy.